No of brick in one stork 10 size 230x110x75. Oil tank capacity - 430liters of system 68 Hydraulic oil. Weight of the main moulding machine 4500kg. Control - worlds best "Schneider" PLC and accessories. Functions - Manuel / Semi Auto / Fully auto. Oil cooling pump motor 1H.P, Pallet Hydro pump motor 5H.P. Pallet out chain conveyor motor 1HP. Model Specification and subject to change for improvement without notice. No of brick in one stork 15 Size 230x110x75. Weight of the main moulding machine 7500kg. 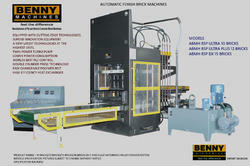 Looking for Fly Ash Brick Making Machine ?